Despite the enormous size of this week's garment, it was finished very quickly. Perhaps because it was the first project from a pattern - Quadrant via Creativebug* - and I didn't have to think about it at all, or perhaps due to the Aran weight yarn on 6mm needles. 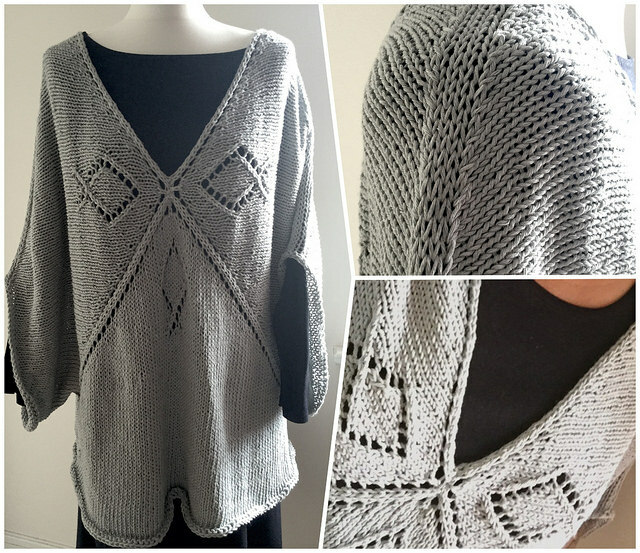 The Quadrant pattern is from Norah Gaughan's 'Knit a Seamless Sweater' class. I will admit to making the sweater from the PDF printout without watching it, but went back to it so I could tell you more. While the pattern was very easy to follow (to anyone with a little knitting experience), the class is in work-along format and beginners should find it very easy to follow. Norah shows all the techniques needed, from casting on, to binding off and sewing in the ends. The design is very nice - both front and back are knit identically from the centre out (if you've made my Seafoam (shawlette-to-shrug) pattern the shape will be familiar) and when they have the right number of stitches, they are joined together so the arm shaping and sleeves can be worked in the round. It is a fun way to knit a sweater and I really like the resulting detail along the sleeve decreases, which you can see in the picture below. Unfortunately, being short and wide, there are some drawbacks to this construction for me. The extra stitches needed to give the requisite ease around the body (and there is a lot of ease), mean the top sections are also enormous, and the v-neck comes below my bust. It's ok at the front but the back is equally as low. If I were taller this wouldn't be a problem, but on my 5'3" frame, I don't love the way it sits, or rather, the way it slips. I feel it would be better suited to a short petite person, or a taller person with a bigger frame. Or someone who is happy to hitch it up at the shoulders regularly. Drops Love You V - recycled cotton - looks fine knit up, but I didn't enjoy working with it. I knit this mostly while multi-tasking, but this splits so easily it was necessary to drop various stitches (on purpose) in order to remedy messy half-stitches on previous rows which I'd made when knitting quickly without looking. As the yarn was only 80p a ball (on sale) and the entire sweater cost less than £11 (including postage) and took a few days to knit, I am not too upset that I don't love it, and I will still wear it - in fact I have it on now - but I have certainly learned from it. However much I like the look of a design, I need to consider my own body and work to that if I'm to end up with a wardrobe full of handmade items that I love. I will definitely look for other Norah Gaughan patterns as I enjoyed the construction and love her aesthetic. Next time I need to consider the fit on MY body. For a design which should be suitable for mild weather, it's quite weighty due to the yarn I've used (it knit to the same gauge as the ribbon yarn in the pattern but I'm guessing it's much more dense). For my next project I've chosen a cotton yarn which is much lighter and can be knit on even bigger needles for plenty of breathability. While this project can't be considered a total success it hasn't dulled my enthusiasm for making another garment straight away, and while I gather the tools for my next sewing experiment, this evening I'll be casting on another handknit. I'll post an update here next week, but you can also follow along on Instagram. Hope to see you there! *Affiliate. I tend to learn far more from the not-quite-right projects than from the just right ones! But I find they often get worn a fair bit, or given away to someone who it suits better. So it's all good. Look forward to seeing what's next!